/ Dog CPR: What To Do If Your Dog Stops Breathing And How To Do It! Do You Know These CPR ABCs? They Could Save Your Dog’s Life! Anyone who has ever witnessed someone having a heart attack knows just how intense and scary it can be. The Red Cross is constantly teaching CPR classes and everyone should take them at least once. And if you’ve ever experienced this situation with your pet, you know that this experience is intense and scary as well. 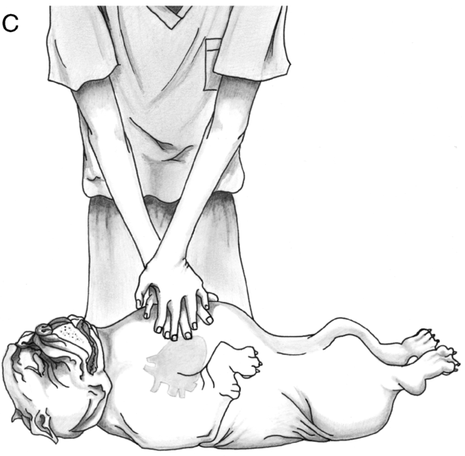 Knowing at least the basics of proper cardiopulmonary resuscitation techniques could one day empower you to save your or someone else’s dog’s life. The following is a great article on CPR for your dog from The DogHeir Team at DogHeirs.com. Please read and learn this important information … your dog will love and thank you for it! Do you know what to do if your dog stops breathing? Knowing a few emergency procedures if your dog is choking, or having difficulty breathing, could save your dog’s life because you may not have time to get to a vet. If your dog has a foreign object stuck in his throat, it is important to try and dislodge it before performing CPR. Read our article: Heimlich Maneuver for dogs. Recommendations on how best to perform cardiac massage / chest compressions on different chest types and sizes of dogs (see diagrams below). 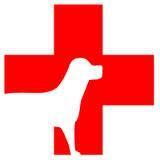 Canine CPR ABCs – Remember Them! 2. Open the jaws to check for obstructions, and if any exist and are not easily removed, try to dislodge the object. 3. Cup your hands around the muzzle of the dog’s mouth so that only the nostrils are clear. Blow air into the nostrils with five or six quick breaths, again, depending on the size of the dog. Small dogs and puppies and require short and shallow breaths. Larger dogs need longer and deeper breaths. Continue the quick breaths at a rate of one breath every three seconds or 20 breaths per minute. 4. Check for a heartbeat by using your finger on the inside of the thigh, just above the knee. 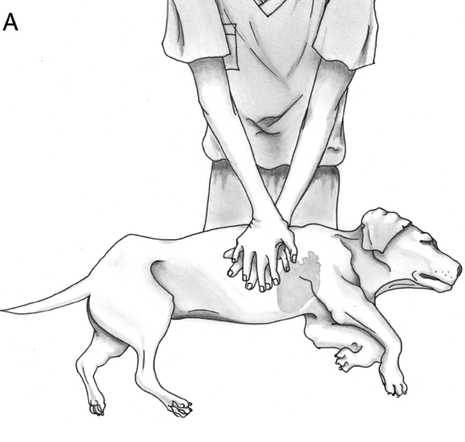 If you don’t feel a pulse, put your hand over the dog’s chest cavity where the elbow touches the middle of the chest. If you still don’t find a pulse, have one person continue breathing into the nostrils (mouth to snout), while another gives chest compressions / cardiac massage. If you are alone, do the compression and mouth-to-snout ventilation yourself. 5. 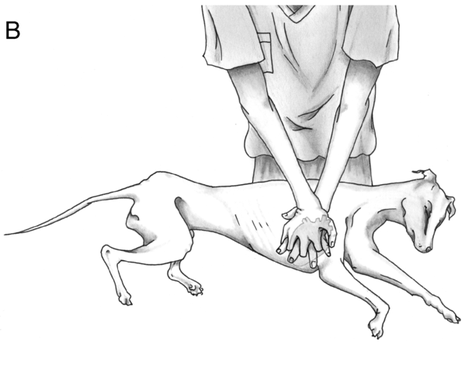 Give the dog chest compressions (cardiac massage) by placing both hands palms down on the chest cavity of the dog. For most dogs, chest compressions can be performed on the widest part of the chest while the dog is lying on his side. For smaller dogs (and cats) chest-compressions scan be done with one hand wrapped around the sternum, encircling the heart or two-handed on the ribs. For large dogs, place your hands on top of each other. For small dogs or puppies, place one hand or thumb on the chest. 6. Use the heel of your hand(s) to push down for 30 quick compressions followed by 2 breaths of air (ventilation) and then check to see if consciousness has been restored. If consciousness has not been restored, continue the compressions in cycles of 100 to 120 chest compressions per minute (the same rhythm administered for people). 7. Perform CPR in 2-minute cycles checking to see if breathing and consciousness has been restored.